The outstanding characteristic of the series PM-IP67A from MTM Power is the protection type IP67 design. The patented thermoselective vacuum encapsulation special 7/8" connectors enables an undisturbed use of the power supply modules with AC (90…264 VAC) and DC (100…353 VDC) wide input range in the field. 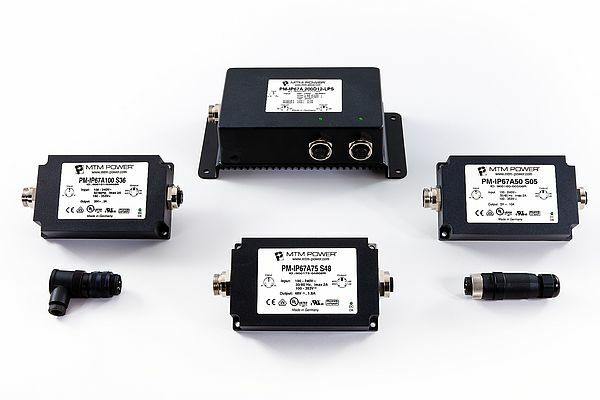 The modules of the series PM-IP67A are available with common single and dual output voltages. They are designed for worldwide use under extreme environmental conditions like dust and humidity and allow an efficient, cost-saving solution for different tasks in all "on machine" applications. They are especially designed for decentralised systems without switching cabinets. Further features are rugged design, SMD-technology, automatic 100 % final test and 100-%-burn-in-test. The series PM-IP67A offers 50, 75, 100 or 200 W constant output power; it is short circuit protected, needs no ground load and is operating within a temperature range of -25 to +70 °C. The modules are VDE and UL/cUL approved. The devices with the output voltage of 24 V are also available as Limited Power Source version.